The Ghent Service Jam is part of the Global Service Jam. This is an annual worldwide event organised by service design enthusiasts. It’s all about creative problem solving and co-creating new service prototypes in just 48 hours. People at hundreds of locations all over the world will be jamming at the same time. Every Jam will be working around the same topic that will be officially announced at the beginning of the weekend. We are going to have a lot of fun, so don’t hesitate to sign up. The emphasis is on doing rather than talking. As a jammer, you will learn and experience the service design process, methods and tools in just one weekend. We will guide you in teams to create and prototype your ideas. We will also organise 20-minute expert talks. 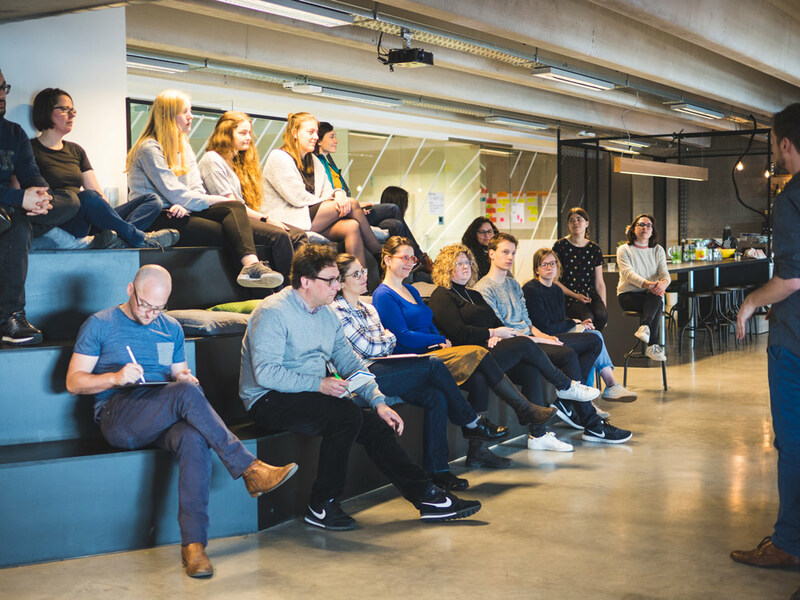 Belgian service design experts will enlighten you with tips and tricks from their years of working experience. At the end of the weekend every team will have the chance to pitch their prototype to a jury and receive feedback by professional design practitioners. Basically everyone can join our jam! Students, design professionals, teachers, teenagers, entrepreneurs, thinkers, doers, ... Absolutely everybody is welcome. You don’t need experience or a background in design. The only thing we’ll expect you to bring is tons of motivation and enthusiasm to collaborate and share new and crazy ideas. WHAT’S INCLUDED IN THE TICKET? This is a non-profit event, but we do ask you to buy a ticket for €35 to cover the expenses. This ticket includes dinner and drinks on Friday evening, breakfast and lunch on Saturday and Sunday and drinks after the presentation on Sunday afternoon. Of course there will be lots and lots of coffee, tea, water and snacks during the weekend. We will also provide design and prototyping materials, wifi and a really cool working space. What does a design jam look like? We are organising our Jam at the Knight Moves’ headquarters in Ghent at Dok Noord. It’s an inspiring location with everything that’s needed for a creative jam. Be prepared for a whole weekend of inspiration and fun. You don’t need to bring anything. A laptop could be handy, but it’s not necessary. Unfortunately there are no more tickets available for this year’s edition. If you want to be added to the waiting list, send a mail to maria@knightmoves.be or julie@knightmoves.be and we will let you know if a spot becomes free. We will have an awesome team of creative minds to help you throughout the weekend! Our experts will guide you through topics like user research, prototyping or pitching your idea. On Sunday afternoon you will have the chance to present your projects and get feedback from our jury members. Can I attend just one day of the jam? Sadly, it’s not possible to attend for just one day. We work in teams to ideate, research, prototype and test the ideas. It’s all about team effort. We understand if you arrive a bit late or leave a bit earlier, but please let us know in advance. If you can’t make it for the whole weekend, but really want to get a taste of the jam, you are always welcome to attend the final presentations on Sunday afternoon. Can I stay over at the venue? We don’t provide a place to sleep. But there are a lots of hotels, B&B’s, airBnb’s or hostels in the city centre. If you have trouble finding one, we’re happy to help you. Are we going to work on projects that we bring to market on Monday? If you think you can, we encourage that of course! However, it is most important that you take the opportunity to try out and learn from each other. I have a challenge related to my job that I would like to work on, can I come in and work on that? We’d rather that you didn’t. We want you all to get inspired from each other and work on ideas based on insights from fieldwork. However, this might be the opportunity to meet creative and interesting partners in solving your big work problem. Do you have a question that's not on the list? Don't worry! Just send us an email at maria@knightmoves.be or julie@knightmoves.be. We will be happy to answer!